Phu Quoc is a popular tourist destination that many domestic and international tourists come to enjoy their holiday. Due to the increasing number of tourists coming to Phu Quoc, the need of Phu Quoc accommodation is a matter of great concern. 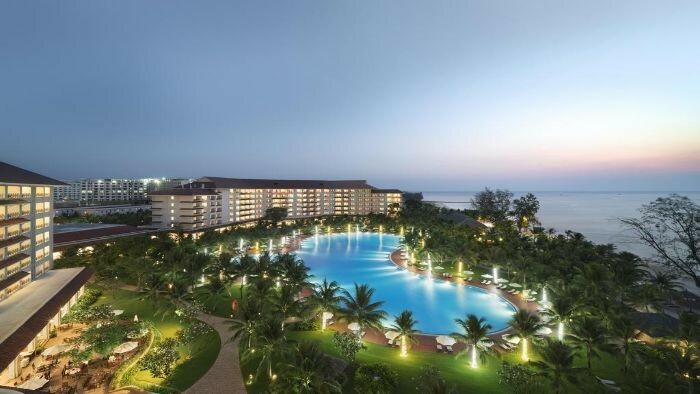 So today, we would like to send you the list of 5-star Phu Quoc resorts that are both good quality and beautiful view. Located at Khem Beach in the south of Phu Quoc island and 16 km from Phu Quoc International Airport, JW Marriott Phu Quoc Emerald Bay is currently a destination known to many tourists for its beautiful scenery. This 5-star resort has a total of 244 accommodations including rooms, suites, apartments and villas. All are based on the idea of ​​a fictional college: Lamarck University. This is a masterpiece from the famous architect Bill Bensley with a mix of classical architecture with the comfort of modern technology which is worth to get to international level. Moreover, guests can enjoy impressive rich cuisine at 5 contemporary-style restaurants and bars. This is one of the paradise resorts in Phu Quoc that you should not ignore. With a peaceful atmosphere, beautiful scenery, La Veranda Resort Phu Quoc MGallery by Sofitel is always in the list of 20 best quality resorts in Vietnam. If you are looking for a place to enjoy a romantic, warm honeymoon and have many beautiful memories with your loved one, La Veranda is the ideal choice. The resort is surrounded by a tropical garden to help guests mingle with the green nature. 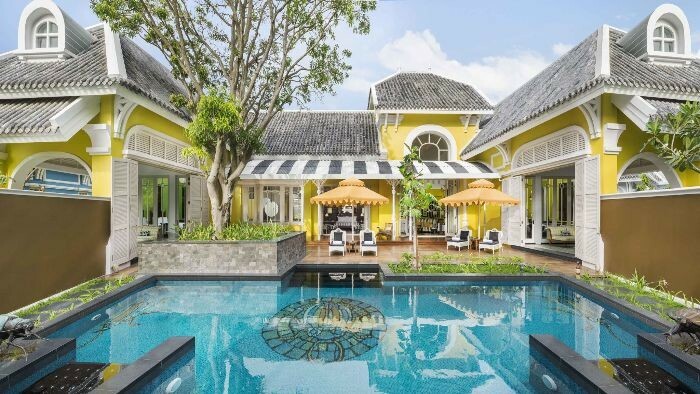 With a total of 70 rooms designed in French colonial style, the resort will give you the most relaxing moments in Phu Quoc, it is such an ideal place to stay away from the noisy, bustling atmosphere in the town. Enjoy a delicious dinner under the night sky and the romantic atmosphere at the sea, you will have the unforgettable moments in Phu Quoc trip. Stretching on Bai Dai beach - one of the 10 most beautiful and pristine beaches in the world, Vinpearl Phu Quoc Ocean Resort and Villas is a favorite destination for both domestic and foreign tourists. Built and managed by Vingroup with 2 suite villas, 115 villas with 4 bedrooms with 2 floors, 50 duplex villas and 172 villas with 3 bedrooms and 1 floor to bring you more selection. There are also entertainment areas with many interesting games, 27-hole golf complexes, Safari zoo, MGM GRAND casino, etc. Built on an area of ​​7.3 hectares right next to Bai Truong, Novotel Phu Quoc Resort is considered a world-class resort at beautiful Phu Quoc Island. At Novotel Phu Quoc Resort, visitors not only experience sophisticated and luxurious rooms but also satisfy with the dedicated and thoughtful service style of the staff. Resort now has a total of 400 rooms including beach front villa, villa with pool, deluxe twin villa, suite, superior, family room, etc. All rooms are designed in a modern architecture with the most advanced equipment to bring comfort to guests. With 2 restaurants with a rich menu and 3 bars, Novotel Phu Quoc Resort also has many other facilities for entertainment such as gym, 2 tennis courts, spa, 2 large swimming pools, etc. Lying in the private bay of Cua Can with an area of ​​over 20 hectares, Fusion Resort Phu Quoc with 97 high-class villas facing to the sea is the choice of many tourists when coming to Phu Quoc island. Fusion Resort Phu Quoc is a harmonious combination between contemporary design and simple beauty of the countryside. The resort is covered by lots of green trees to help visitors immerse themselves in nature, bringing a feeling of warmth and closeness. Each villa at the resort has a separate swimming pool and garden to help visitors have relaxing moments in a quiet space. All worries and fatigue of the cities seem to be removed when you come to Fusion Resort Phu Quoc. Salinda Phu Quoc is currently one of the 5-star luxury resorts located on the coast of Duong Dong town. The resort is built on the idea of ​​combining indigenous culture with contemporary architecture. Located along the coast, the resort has all 121 rooms and villas. 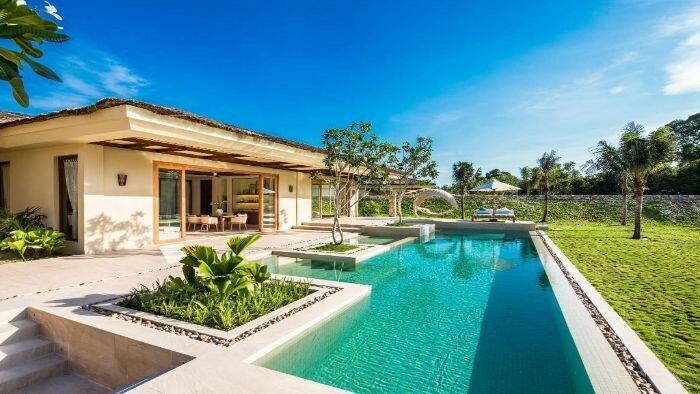 In addition, Salinda also has swimming pools for each age: the pool is wide and deep for adults, and the children will be entertained comfortably in a small beautiful pool with very safe water level. Not only attracted by the beauty of architecture, guests but also are participated in many attractive games. Some games are chosen by many tourists such as kayaking, snorkelling, karaoke, billards, etc. Salinda Phu Quoc Resort and Spa promises to bring you the most relaxing moments. These beautiful resorts below are enough to make you fall in love? Book now and invite your friends to experience a memorable vacation in the south of the country. Thank you!